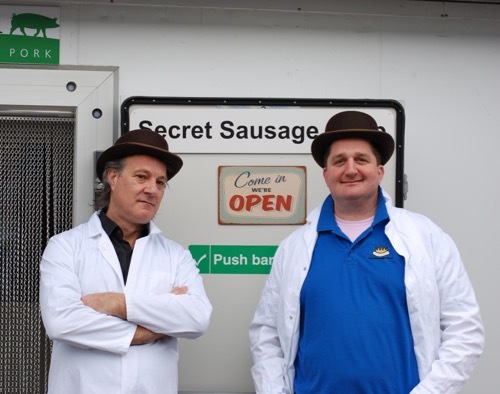 Meat Masons, who run the secret sausage shop, was the idea of James Goodchild a chief investment officer. 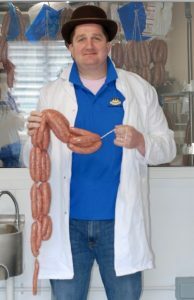 They have the only meat EC approved plant in Hertfordshire and produce a regular range of 10 sausages. 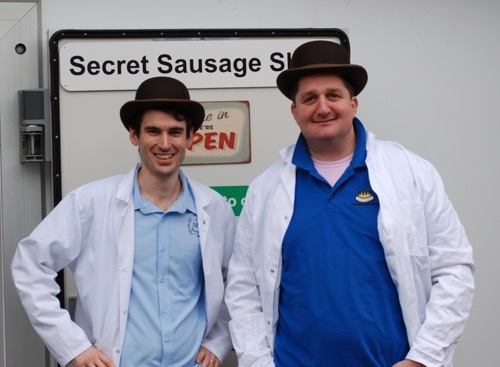 Finding a secret sausage shop can be tricky, luckily the Meat Masons, who run the shop, have left a few clues on their Facebook page! When you spot this classic fiat outside you will know you have arrived! Over time the plan is to produce some of the recipes that have been invented at James’ secret sausage club. Yes, you read that right, a secret sausage club! James and some of his good friends have been meeting for about seven years in his converted garage inventing awesome meaty recipes. That sounds like my kind of club! The Bishop’s Stortford – for the discerning customer, complex ingredients including nutmeg, ginger, mace, coriander with sage and clove! The Town Centre – a hot town on a Friday night with mustard seeds for a full flavour satisfying sausage. This was like being a kid in a sweet shop! Luckily James, who is ably assisted by food supremo Michael, had a frying pan handy so we cooked up a selection to sample there any then. The sausages were very very good and I might need to review my list of top twenty sausages on the basis of this visit! James Goodchild got into food and sausage making by chance after reading an article on the daily commute to London. “Something in the article got me thinking” he said. 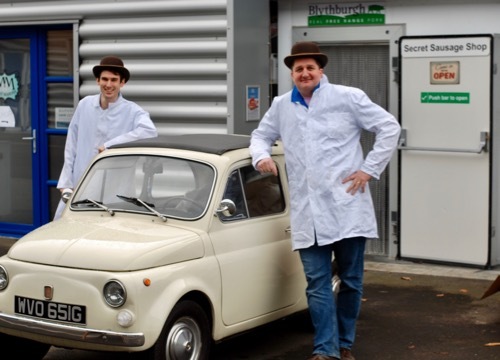 “Knowing where your food comes from is very important and, with a selection of friends, we took the opportunity to get all willy wonka and try and invent our own great sausage recipes in the secret sausage club which I now plan to sell in the shop”. 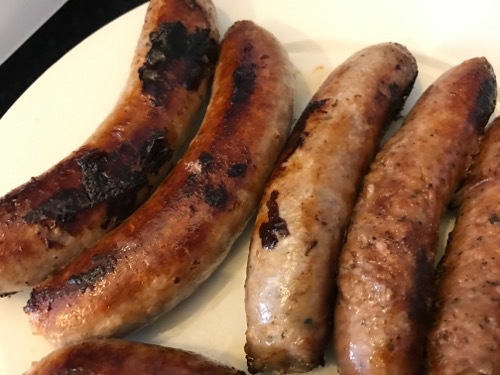 I must have eaten over 1000 sausages in my search for sausage perfection around the UK and I was very impressed with Meat Masons and their Secret Sausage Shop. They care a lot about the quality of their sausages and burgers and where the ingredients come from. But they don’t take themselves too seriously although Michael does do a good serious impression! 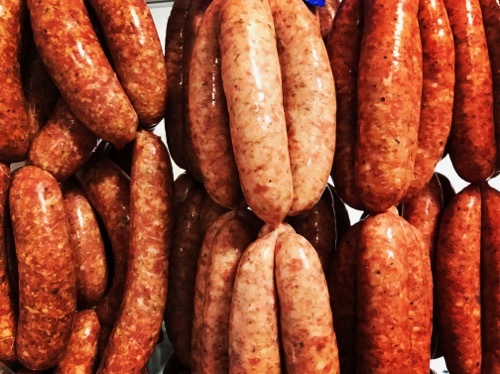 These guys are friendly, knowledgeable, down to earth quality sausage makers and I recommend you pay them a visit to try the magic for yourself!